15 - 1 parallel dots (Neer Pulli) Kolam. Start with 15 dots in the center, leave one dot at both ends and stop at one as shown above. Join dots as shown in the below pictures. your kolams are too good.can you upload still more number of flower kolams ,peacock kolams and deepam kolams. Thank you for visiting my Kolam site. Yes. I will post more kolams. Very nice website. Very clear information about each kolam. Please try to post more. Thank you Archana. I will post more kolams which I hope to keep this art alive. I and my daughter drew and colored this kolam in our driveway, reminiscing my childhood pongal days. Thanks for the step by step guide, it was easy to follow. I and my daughter drew and colored this kolam for pongal today, reminiscing my childhood pongal days. Thanks for the step by step guide, it makes it very easy to follow. Thank you for visiting my site. Nice to hear you drew this kolam for Pongal. Wish you and your family a very Happy Pongal. Absolutely stunning kolams..all of them...my Navarathri was very special since I put a different one of your kolam desigms each day...thanks for the wonderful job....Wish You and your Family A Very Happy Navrathri & VijayaDasami. Thank you very much for visiting my blog. I really happy to note that you drew my kolams for Navaratri. Wishing you and your family Happy Puja Celebrations. please upload more cow kolams for mattu pongal. i tried in all websites but i can't get it. 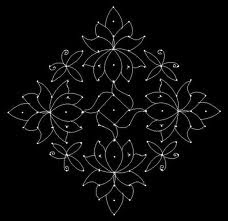 Thank you for your interest in my kolam. I have added your e-mail in my subscription list. Please confirm the verification e-mail sent to you for receiving my kolams to your e-mail. Am Gomathy Subbaraman. All these years I have been waiting for someone to teach me step by step how to make kolams. Am extremely happy now. Your kolams are too easy to follow. Now every morning I put new kolams and get appreciation which actually belongs to you. Thank you for visiting my blog. Glad to note that my kolams are helpful to you. i was really excited to see this much of kolam.. thanks alot and hats off for ur effort. Can v able to go directly to the kolam no.we want or should search it. bc i saw kolam 33 few min b4. now i couldn't get.. could u pl help me. also i've added my id for subscription just now. I liked the Kolams. They are beautiful and Easy to learn. We are celebrating Ugadi festival in our office. 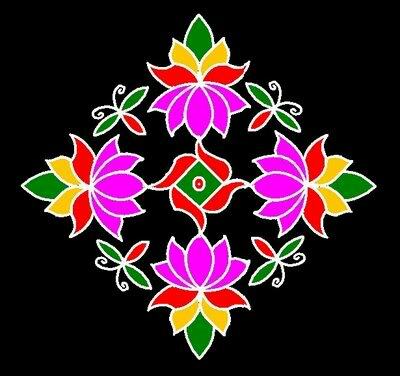 Can you add few kolams related to Ugadi. I am senthur selvi.I liked ur kolams very much.kolams in this site are amazing.Good job mam and keep adding more kolams.i convey my best wishes to u. Though I often browse for kolams regularly,I am amazed to find such varieties in ur blog..
Can u show some figures of Gods thru' kolams? For the past few years, I am checking out your blogsite for Kolams, your kolam number 172 is the regular for Saraswathi Puja, Hats off to you for your effort.